The 2019 Season is beginning to take shape! Keep an eye on our website and Facebook for updates and registration information! Registration for all levels of football has begun! Details can be found on our Registration page. Thank you to everyone who attended our Beef & Beer Bingo Bash this year!! We had a great time and one of our best year's ever, raising over $3,500 for the Conrad Weiser Little Scouts!! Thank you for your support of the youth of Conrad Weiser and Youth Football!! Thank you to all the coaches, parents, volunteers and everyone who helped make the 2018 season one of the most successful Little Scouts seasons in recent years! Congratulations to our Varsity Mighty Mites squad for finishing 2nd in the BAYFL Championships. 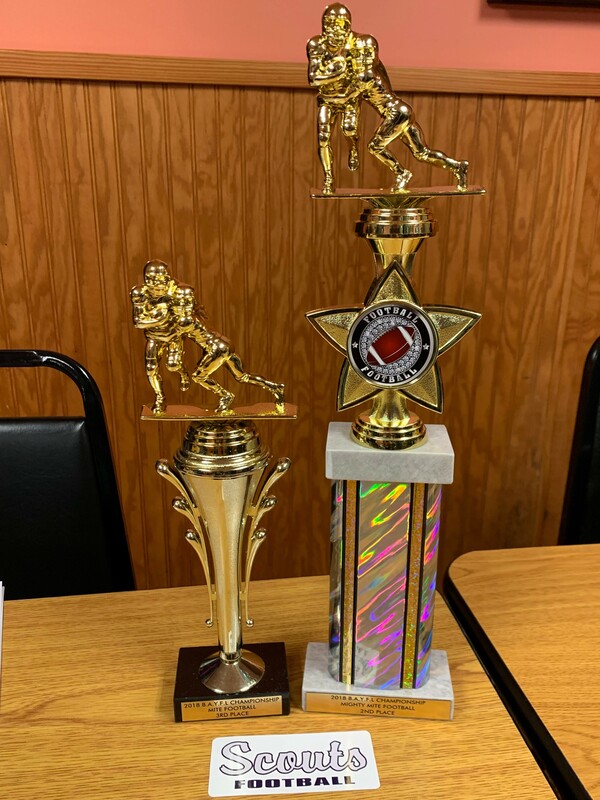 Due to the early snowfall, unfortunately, our Varsity Mites did not get a chance to play in the 3rd place game, but they had a great year as well!! We look forward to seeing everyone in 2019! Congratulations!! Mites and Mighty Mites Playoff Bound!! Congratulations to our Varsity Mites and Varsity Mighty Mites Squads!! Both teams have qualified for the 2018 BAYFL Playoffs!! The Mighty Mites, with a record of 7-1, are the #2 Seed and will face Oley Valley in the semifinal round on Sunday, November 11 at 11:00 am at Oley Valley Middle School. The Mites, with a record of 6-2, are the #3 Seed and will face Upper Perkiomen in the semifinal round on Sunday, November 11 at 12:30 pm at Oley Valley Middle School. Come out and cheer on our Conrad Weiser Little Scouts!! Just a reminder, there is absolutely NO PARKING inside the gated area and loading dock area behind the buses. This is a school district requirement. This area is reserved for high school and middle school athlete pickup only. The school is very strict about this policy. Below is an image of the area in question. You are NOT permitted to park or ENTER the area in Red. Plenty of parking is available in the areas outlined in Green. Every year, the school approaches us about violators. If you see someone parking there, who may not realize this, please remind them. Please also inform any other family members or friends who may be dropping off or picking up your son. The school graciously allows us to use these facilities free of charge. We would like to continue to use them in that manner. Thank you for your cooperation! We now have a RainedOut automatic texting account. Please sign up with your cell phone or email and you will receive an instant notification when practice or games are canceled due to weather. site map | C4Site Factory™ is a trademark of Echo Valley Graphics, Inc.